The University has adopted targets to make an equitable contribution to reducing our ecological footprint. We have adopted corporate performance indicators for reducing energy usage and developed strategic plans to drive reductions. Fluorescent tubes have been replaced with more energy efficient LEDs in the Science Building, Auchmuty Library, Sports and Aquatics Centre and the Hunter Building. Motion sensors have been installed in many areas. External street lighting is being converted to LED in an ongoing program with installs taking place as external lighting reaches end of life. Across our campuses we have installed over 650 photovoltaic (PV) panels across our campuses with more projects coming. 80kW of solar PV were installed in 2014 and 2015 at Port Macquarie, Tamworth and Taree. These systems are estimated to generate approximately 120,000 kWh per year of electricity and to reduce emissions by 100 tonnes of CO2/year. 75kW of solar PV were installed in 2017 at Ourimbah with an additional 60 panels being installed in 2018. Solar hot water has been installed on the new student accommodation at Callaghan. Hot water systems are being converted from electricity to natural gas with solar pre-heat. A waste audit was conducted in 2014 at our Callaghan, Central Coast and Newcastle CBD campuses. The audit included outdoor waste generation, University buildings, retail and entertainment precincts and student accommodation on campus. The results are informing waste management improvements. A Landscape Management Implementation Plan was written in 2012 to establish a program of works for bush regeneration at the Callaghan "bushland campus". Now in its third year of implementation, improvements can be seen with widespread weed reduction and successful restoration areas. Callaghan and Ourimbah campuses are improving bushland health. Community Environment Network has worked at both sites in 2014 and will continue through 2015, clearing large areas of noxious and other weeds and planting over 6000 native grasses, shrubs and trees to improve biodiversity and maintain habitat corridors and linkages. Students can participate in bushland projects by contacting the University Student Landcare Group. There are a number of construction projects on campus such as the NIER extension, car park expansions, new accommodation etc which have required tree removal. To find out more about whats being done for tree removal click here or the feature on the right. An annual Bushland Health Scorecard has been developed providing a summary of what has been achieved since 2014. 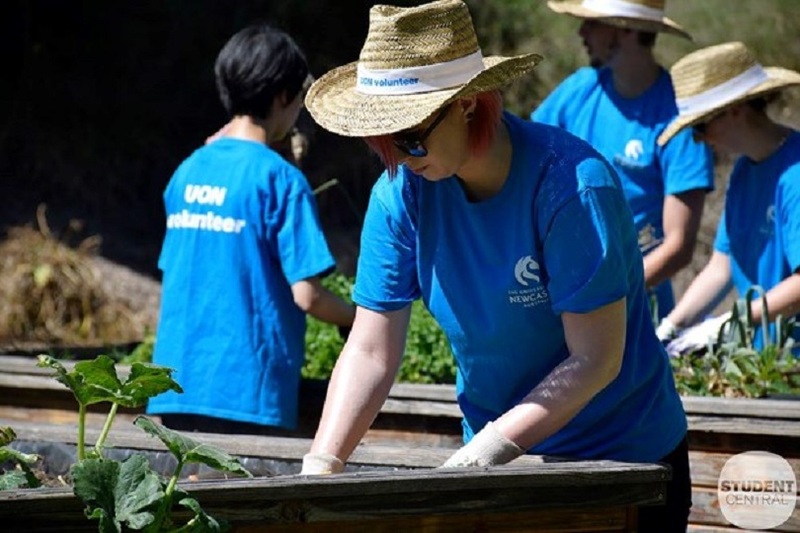 The University is a key stakeholder in a Newcastle Riparian Connections project managed by WetlandCare Australia. The project aims to restore urban waterways in the Newcastle catchment. There are two large wetlands on the north side of Callaghan campus surrounded by riparian corridors. The wetland behind engineering precinct at Callaghan provides ideal breeding habitat for mosquitoes, especially when it becomes overgrown with Giant Waterlily. In November 2014 the wetland was almost 100% covered in Waterlily. Contractors used a motorised barge to mow and remove the Waterlily. Repeat spraying will be required during the growing season to control coverage and improve the wetland health through increased oxygenation, improved foraging for waders, decreased breeding habitat for mosquitoes and increased opportunity for fish to eat mosquito larvae. A water quality monitoring program has been established. UON installed two bike hubs each with 52 bike racks, 42 lockers, showers and toilets. The immediate success of these hubs has been a catalyst for additional cyclist infrastructure and cycling initiatives. The bike hubs are consistently reaching maximum capacity, and it is estimated that the number of visits to the Bike Love Corral workshop located at Bike Hub East has tripled since last year. The Active Travel Initiative launched during Orientation Week in 2015 offers maps, tips, and workshops to support walking and cycling to campus. 206 'ready to ride' $50 deals for students were sold, which included a fully reconditioned bike, helmet, lock and high visibility vest. Regular bike maintenance and safe cycle skills are now run at UON. Plus, bike buddies and bike buses are now available to help new riders or regular riders meet new people. Construction will soon start on NeW Space in the Newcastle CBD. The plans include over 200 secure bicycle parking spaces as well as end of trip shower and storage facilities. Continuing its growth since launching in 2013, there are now 500 registered carpool users with 39 parking bays at Callaghan. Eight carpooling bays were added in 2015 to the Central Coast Ourimbah campus. Visit student transport or staff transport for a full view of all our sustainable transport initiatives. The University was one of the first in the tertiary education sector to prepare a Strategic Asset Management Plan in 2012 which provides the opportunity to drive leading and innovative environmental sustainability measures in our campus facilities and activities, in particular to reduce energy consumption. In 2014 the University developed SAMP 2 to ensure that our physical assets and related services support the University's mission to be a global leader in its spheres of achievement. The SAMP enables the University to optimise asset investments by applying risk assessments, life cycle costing, economic appraisal, environmental and social impact assessment and value management. NeW Space in the Newcastle CBD has been designed to achieve a 5 Star Green Star Certification rating. Refurbishments of currently existing buildings are to achieve an equivalent 4 Star Green Star rating. Sprouting everything from sunflowers to lettuce, to rosemary and tomatoes The U Community Garden is a sure fire gourmet hit. Overview of the 2014 waste audit results for UON. Construction projects at UON have increased need for tree plantings and rehabilitation across campus.